The Holley replaceable air bleed will fit all Holley 4150 and 4500 HP carburetors with screw-in air bleeds. 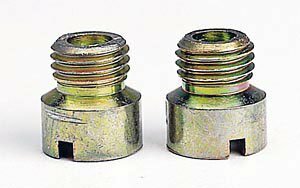 These main jet extensions feature a design that screws into the metering block so the main metering jet can thread into the end of the extension. This installation moves the fuel entry point for the main jet out into the fuel bowl. The thread size measures 1/4-32 unified fine thread and it is made of brass. The Edelbrock Metering Jet is designed for use with the Edelbrock Performer Series and Thunder Series AVS carburetors. The jet and rod is changed to get the cruise air / fuel ratio leaned out. The step in the rod changes the effective jet area between high and low manifold vacuum conditions. This standard main jet is manufactured to high tolerances for consistency and is designed to fine-tune the carburetor for street or race applications. The hole size measures 0.064'' and is threaded for easy installation and removal. It is a replacement jet and comes with 1/4-32 unified fine thread. This standard main jet is manufactured to high tolerances for consistency and is designed to fine-tune the carburetor for street or race applications. The hole size measures 0.0820'' and is threaded for easy installation and removal. It is a replacement jet and comes with 1/4-32 unified fine thread. This standard main jet is manufactured to high tolerances for consistency and is designed to fine-tune the carburetor for street or race applications. The hole size measures 0.0840'' and is threaded for easy installation and removal. It is a replacement jet and comes with 1/4-32 unified fine thread. This standard main jet is manufactured to high tolerances for consistency and is designed to fine-tune the carburetor for street or race applications. The hole size measures 0.0890'' and is threaded for easy installation and removal. It is a replacement jet and comes with 1/4-32 unified fine thread. This standard main jet is manufactured to high tolerances for consistency and is designed to fine-tune the carburetor for street or race applications. The hole size measures 0.0685'' and is threaded for easy installation and removal. It is a replacement jet and comes with 1/4-32 unified fine thread. This standard main jet is manufactured to high tolerances for consistency and is designed to fine-tune the carburetor for street or race applications. The hole size measures 0.060'' and is threaded for easy installation and removal. It is a replacement jet and comes with 1/4-32 unified fine thread. These metering orifices control fuel flow into the metering system. They are rated in flow capacity ”cubic centimeters per minute and are changeable for tuning purposes. The shape of the entry, exit, and size determines flow. All Holley Main jets are flow tested and then stamped with the correct number. Click on Catalog Product Page for complete listing of jets and sizes. 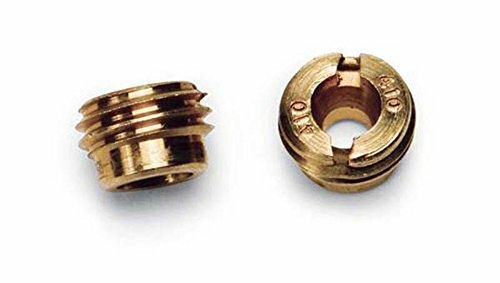 Features Fits All Holley Model 2010, 2300, 4010, 4011, 4150, 4160 & 4500 Sizes from 40-110 1/4-32 Thread .040 Jet size Standard Main Jet Jet Hole sizes provided for reference only . All Holley jets are sized by actual flow and may vary from sizes above. 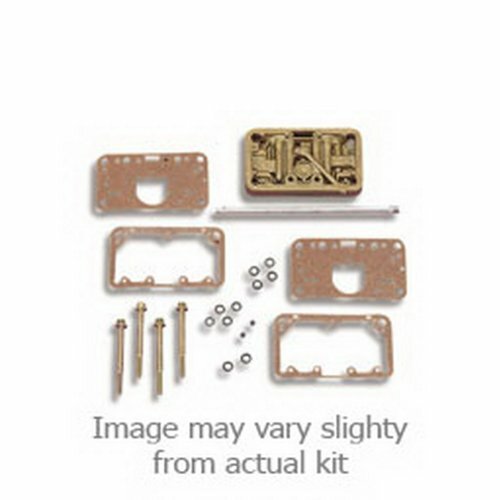 This secondary metering block kit helps convert carburetors with center-hung float bowls. It allows the use of metering jets and includes gaskets and longer fuel bowl screws. It does not include fuel bowls and has no provision for a power valve. This standard main jet is manufactured to high tolerances for consistency and is designed to fine-tune the carburetor for street or race applications. The hole size measures 0.066'' and is threaded for easy installation and removal. It is a replacement jet and comes with 1/4-32 unified fine thread. This standard main jet is manufactured to high tolerances for consistency and is designed to fine-tune the carburetor for street or race applications. The hole size measures 0.0870'' and is threaded for easy installation and removal. It is a replacement jet and comes with 1/4-32 unified fine thread. This standard main jet is manufactured to high tolerances for consistency and is designed to fine-tune the carburetor for street or race applications. 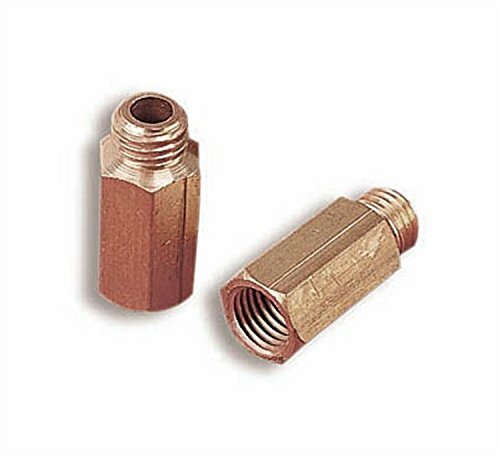 The hole size measures 0.663'' and is threaded for easy installation and removal. It is a replacement jet and comes with 1/4-32 unified fine thread. This standard main jet is manufactured to high tolerances for consistency and is designed to fine-tune the carburetor for street or race applications. The hole size measures 0.0735'' and is threaded for easy installation and removal. It is a replacement jet and comes with 1/4-32 unified fine thread. This standard main jet is manufactured to high tolerances for consistency and is designed to fine-tune the carburetor for street or race applications. 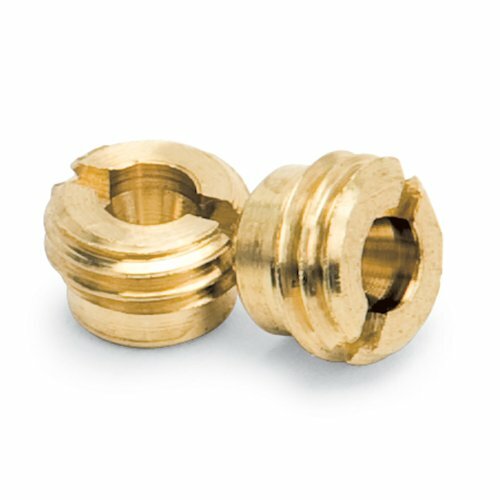 The hole size measures 0.0693'' and is threaded for easy installation and removal. It is a replacement jet and comes with 1/4-32 unified fine thread.